Restricting yourself to listening to music that sounds like what you already like can be dull — if you want to break out of that mold, Spotify can help. When you use Last.fm with iTunes, you’re restricted to scrobbling music that’s already in your Library. But with Spotify, you can choose to scrobble any tracks from Spotify’s massive database, even if you’re hearing it for the first time. By scrobbling through Spotify, you’ve expanded your musical horizons just that little bit more, meaning Last.fm can find genres of music you normally wouldn’t listen to. 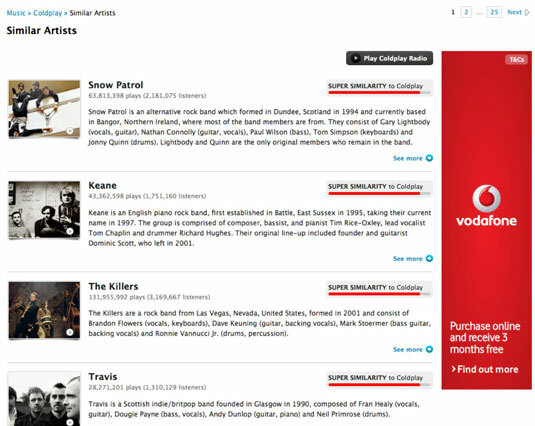 Similar artists: Go to an artist’s Last.fm profile and click the Similar Artists tab on the left sidebar to display a list of artists who are similar, ranked from Super Similarity down to Lower Similarity. Last.fm says that ageless American singer Cher has Super Similarity to Sonny and Cher (obviously). It also tells you that Madonna, Cyndi Lauper, Kylie Minogue, and Celine Dion have Very High similarity to Cher. Slightly down a notch are Mariah Carey and Whitney Houston, with High Similarity. Down at Lower Similarity, you see La Toya Jackson and Meat Loaf. Here’s another example: the band Coldplay has Super Similarity with Snow Patrol, Keane, The Killers, Travis, and The Fray. Down a notch (at Very High Similarity) are Kings of Leon, Radiohead, U2, and Oasis. Toward the bottom of the back are The Police and Alicia Keys. Neighbors: Find other Last.fm users who have similar tastes by accessing your musical neighbors (who, ironically, could be on the other side of the world). From your Profile page, click the Neighbors tag to bring up a list of people who listen to the same artists that you do. View which artists overlap, and click through to the users’ profiles to find out whether there’s anything new you might want to hear. Events: Last.fm recognizes your location and suggests musical events happening in your area, if you feel like getting out into the real world! You can also mark concerts and festivals you’re planning to attend and see who else from Last.fm is also planning to go. Friends: Last.fm has a new Friend Finder feature that searches for your Facebook friends (or Contacts you’ve saved in Gmail or Yahoo! Mail) who’ve registered on Last.fm. You can then send friend requests to any matches. After your request has been approved, their activities then appear in your feed, like they do on Facebook and Spotify. Without this feature, you have to manually look up someone’s real name or username, and then send him a friend request, which can be a little frustrating because not everyone uses their real names and it can be hard to guess someone’s username (especially because so many usernames have already been taken). Forums and groups: Last.fm has a bustling community of groups and forums. You can talk about your favorite music with fans by posting to the online message boards or by joining a relevant group (you can also create your own group!). There are plenty of Spotify-specific groups, too — just do a search for Spotify in the Search text box at the top-right of the page. Shouts: People can leave shouts (or comments) below epic tracks that they enjoyed, and they can read what other people had to say about the same tracks. Your username (and picture, if you’ve uploaded one) appears next to your shout. Click a shouter’s username or picture to access her profile and find out more about that user and her musical likes.